Torque is the second book in Shauna Allen's "Jack 'Em Up Series. This is Jesse and Rachel's story. I loved this book. The characters are well written, easy to connect with and are just regular people, not millionaires, super naturals just the guy or girl next door. 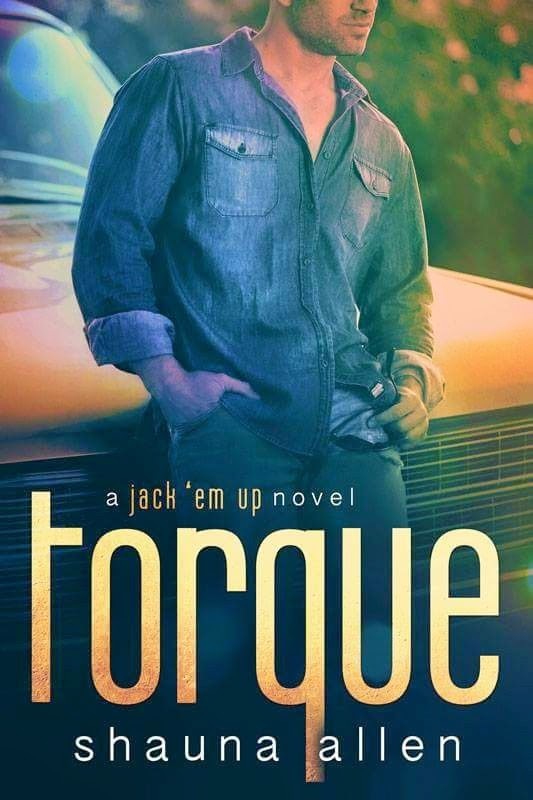 Jesse has recently been released from prison, he is working for his best friend Blake at Blake's garage " Jack 'Em Up." Jesse is an expert at rebuilding motorcycles, but is worried that his past is causing Blake to lose business. Jesse has had a thing for Rachel for what seems like forever, but he never has acted on it, he feels as if he is not good enough for her and that she can do better. Jesse feels that he has a dark side since he beat the guy who was abusing his sister bad enough to land him in jail. He has also been keeping a secret since childhood. Rachel has had a huge crush on Jesse since she first met him in school. Rachel is a successful attorney but she is tired of working with her ex-fiancee and she really doesn't agree with the direction that their firm is taking. Rachel is interested in helping people more than she is interested in making a ton of money. Rachel approaches Jesse about rebuilding her dads old Indian motorcycle. When Jesse says yes she is really excited about not only having her dads motorcycle rebuilt and learning how to ride it, but she is also hoping to spend more time with Jesse. Jesse begins working on Rachel's dad's old Indian motorcycle at Rachel's house on the weekends and they start connecting on a level that Jesse feels could be bad for Rachel but he just can not seem to stay away from her. That is until he ends up back in jail and Rachel decides to represent him. He just doesn't know how to handle that situation and it causes a huge problem. Rachel knows that Jesse is keeping something from her, but he just is not ready to talk to anyone about his long hidden childhood secret. Rachel and Jesse have really great chemistry and things heat up quick. You just can't help but fall for Jesse, he is just such a great guy. He is one of those characters that is written so well you hope to bump into him yourself someplace. Shauna handles a really touchy subject in this book and she does it with class and compassion. She makes you stop and think about how something that happens in childhood really can follow you and effect your adult life. This is a must read if you love romance, a bit of action and reading about subjects that other authors often steer clear of.